Since we Love lentils so much we’re always looking for ways to incorporate them in our meals. 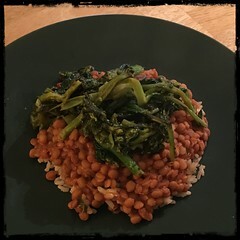 Pairing savory and sweet stewed lentils with rapini not only matches up well but provides a powerfully healthy punch! 2. Toss into large bowl of cold water (with ice). 2. When garlic begins to soften, add the blanched rapini. 2. sauté onions and garlic (with optional hot pepper flakes). 3. When the onions show signs of translucency and the garlic begins to soften, add the hand-crushed tomatoes. 4. After it comes to a simmer, toss in the drained lentils.